'Tis the season to eat turkey, fa la la la la, la la la la! Singapore Marriott Tang Plaza Hotel's best-selling Truffle Buttered Roast Turkey with Finanziera Terrine & Madeira Sauce (4.5-5kg, $238) is making a comeback this year by popular demand. After tasting its tender deliciousness last year and recently again, I can totally understand why. Besides this succulent big bird with aromatic truffle notes, there is also a lineup of scrumptious Yuletide goodies at the hotel forecourt stall for takeaway from 23 November to 25 December 2016. This includes the quintessential Yule log, with interesting flavors such as my personal favorite Red Velvet Yule Log Cake (1kg, $68), Coffee Praline Yu Log Cake (1kg, $68), Pandan Vanilla Snow White Cake (1kg, $68), as well as other sweet treats such as Christmas Stollen (500g, $26 / 1kg, $40) and Gingerbread House (small, $20 / large, $70). Making its debut this year is the Boneless Chicken & Duck Stuffed Turkey "Turducken" (4.5-5kg, $258) which will be a show-stopping addition to any dining table. A slice through revealed the layered goodness where deboned turkey is stuffed with duck and chicken. It's the best of three worlds! The Festive Buffet at Marriot Café is loading up with lots of delicacies for this Christmas and New Year's Year too! 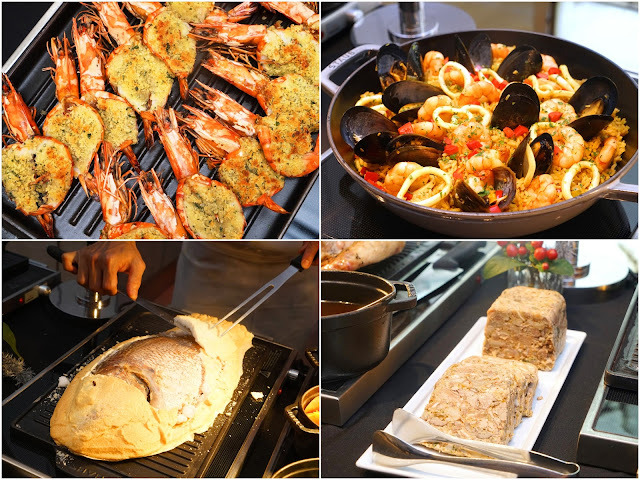 Help yourself to multiple servings of Christmas classics, Western & Asian delights, grilled or seafood on ice, premium charcuterie and delectable desserts! It's the jolliest time of the year when we just want to indulge in holiday feasting! 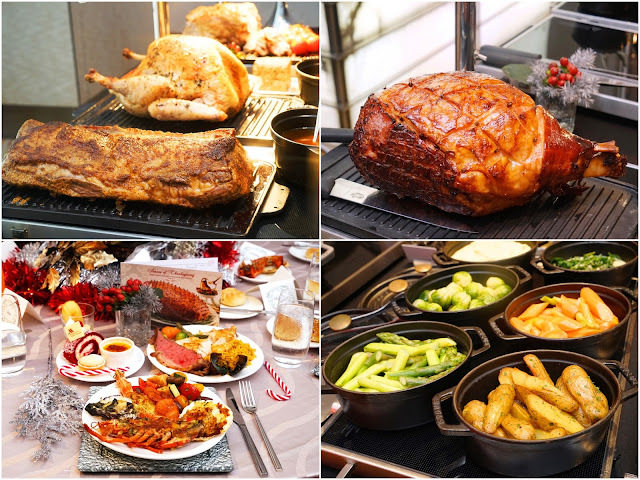 Highlights include Roast Turkey with Dried Fruits & Chestnut Stuffing, Roast Prime Rib of Beef, and Pork Saddle stuffed with Prunes & Pancetta. The Bourbon & Honey Leg Ham was very well-received by our table. Foie Gras Pate with Mulled Wine Jelly was another item which I couldn't get enough of. 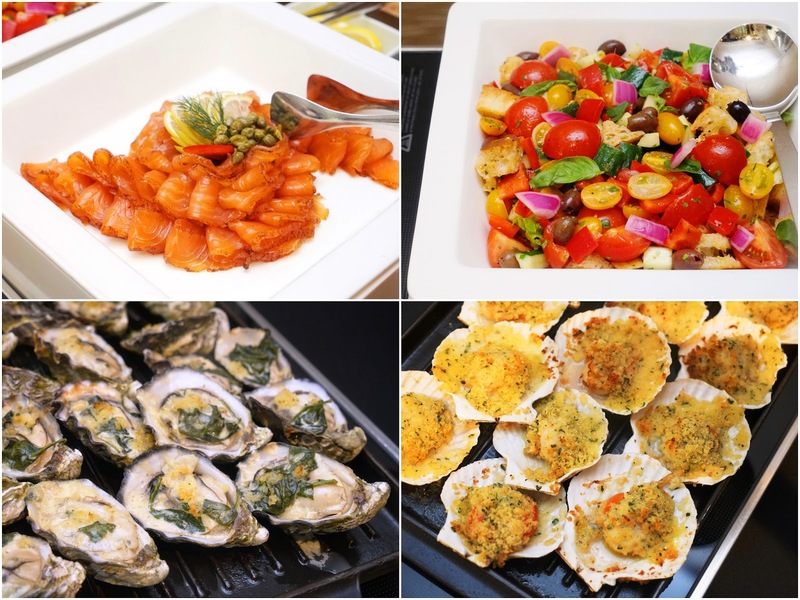 Seafood lovers would be pleased with the Gratinated Scallops, Gratinated Prawns, Lobster Spicy Catalana-style, Oyster Florentine, Lobster Bisque, Gingerbread Bread Spiced Salmon, Baked Salted Whole Red Snapper with Salsa Verde, and Risotto with Squid Ink & Crab. 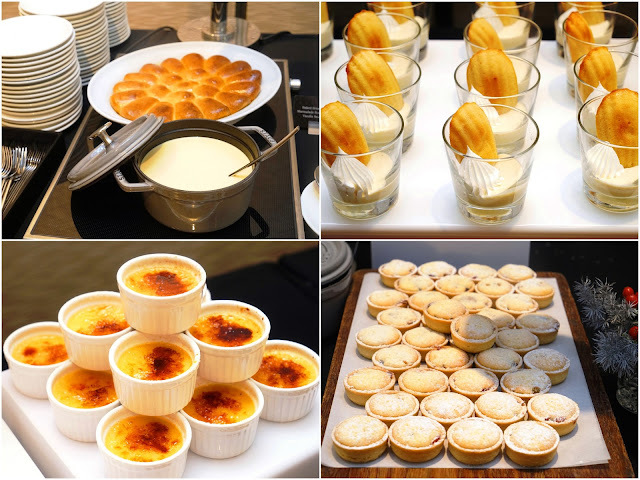 Rounding up the feast are an assortment of sweet treats including Mulled Fruit Brulee, Eggnog Financier Cream Pots, Pink Champagne Jelly, Stollen, Avocado Lemon Minestrone Fruits, and Chocolate Breton Sable with Coffee Ganache, just to name a few. Have yourself a very delicious Merry Christmas, and a Happy New Year! Orders must be made at least 3 to 5 working days in advance.